Logistics company Howard Tenens has taken delivery of two 26-tonne rigid dedicated gas vehicles from Scania. As one of the first hauliers in the UK to introduce dedicated gas vehicles into its fleet, the company has confirmed its commitment to sustainable logistics by trialling the first two of their kind to operate in the country. Dedicated gas trucks are powered solely by CNG which have the benefit of lower carbon dioxide emissions compared to diesel vehicles. Gas technology is also one of the few viable options for decarbonising freight, so has an important role to play in helping the UK meet its carbon reduction targets. 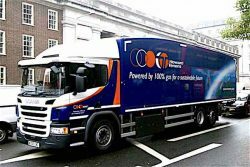 Howard Tenens is a participant of the Dedicated to Gas Project which is part of the Low Emission Freight and Logistics Trial, funded by the Office for Low Emission Vehicles (OLEV) in partnership with Innovate UK. These vehicles will be the first dedicated gas trucks to be deployed under the trial. Neale Ryan, Senior Programme Manager – Automotive, at Innovate UK states: “This first vehicle deployment is another important milestone in the Low Emission Freight and Logistics Trial. Funded by the Office for Low Emission Vehicles in partnership with Innovate UK, the trial will see over 300 low and zero emission vehicles being deployed on UK roads in 2017 and 2018. These industry-led trials will make an important contribution in helping the freight sector in the UK make the switch to lower emission vehicles in the coming years”. The vehicles will be based at Swindon but deliver to a range of customers in urban areas including London. The vehicles will be monitored over the 18 months of the trial which will help answer important questions about operating cost, range, reliability and emissions. Part way through the trial the vehicles will switch to biogas instead of CNG, delivering a 75% reduction in carbon emissions. Howard Tenens has worked closely on the project in partnership with Scania and truck body builder Don Bur since April 2017 to ensure the vehicles were built in the quickest possible time. Scania have developed and provided the vehicle chassis’, with Don Bur providing the trailer bodies using their Teardrop design to improve aerodynamic flow and reduce fuel consumption. “As a leader in the development of gas-powered commercial vehicles, Scania is delighted to partner Howard Tenens in this industry first. By delivering a significant reduction in carbon dioxide emissions, dedicated gas-fuelled operation forms a key part of Scania’s strategy to drive the shift towards more sustainable transport solutions. In addition to being exceptionally clean, gas vehicles are considerably quieter than their diesel counterparts and are therefore ideally suited to operating in urban environments,” commented David Burke, Specialist Sales Executive.